Two days before my reservation begins, I receive an email from Hotel Joaquin. It’s a gentle, automated reminder that its common areas are meant to be a serene space for all to enjoy — so no heavy Instagramming. I’m already looking forward to powering down my screens and taking a moment to myself. Check in is at 3, so naturally I arrive only 15 minutes past. I’m here to make the most of every minute. I park temporarily at a meter and dovetail with a beautiful young man. I trail him closely enough to the heavy wooden front door that I’m inside the radius of his cologne. Inside, service seems to be just getting started. Am I the only person here? The beautiful man has disappeared. But other friendly, not unattractive faces emerge from the blond, paneled woodwork. My reservation is retrieved at a wooden slab of a desk topped with a heavy book engraved in gold foil with the word, “RESERVATIONS,” and also an iPad. I’m whisked to a bar with a glittering ocean view and offered my choice of complimentary spritz: rum, sweet vermouth, champagne, aperol. Right now, though, sipping my Auric Spritz, I am happily in Italy. The beautiful man I had followed inside is back — he’s the bartender. I remark on the view. He jokes about his “office.” It could definitely be worse, I concur. He tells me that the hotel has only been open for two-and-a-half months. 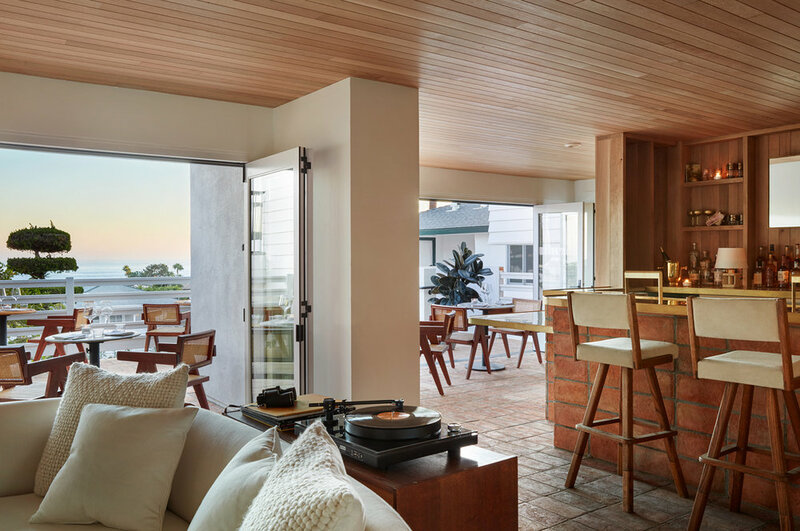 Like many of the Auric Road projects, it was upcycled from an existing property, in this case the underutilized but relatively inexpensive Laguna Motor Inn. Hotel Joaquin has kept the bones — and the topiary trees — but given the rooms a desperately-needed revamp. Perched at the bar, I’m essentially in an open-plan, open-air living room. There’s a record collection guests are permitted to borrow from (all the rooms have their own players), a couch, and a fireplace. Just feet from where I’m sitting, a patio is dotted with dining tables, Saline, the hotel’s restaurant. Stairs on either side lead up and down to rooms. In the center of the space, graded levels drop sequentially from the restaurant to a grassy garden, a heated saltwater pool, a side street, and, finally, the ocean. The seawater sparkles into nothingness. An employee named Nate turns a key (a real metal key!) into my home for the night. Its key ring is stamped with a name, Maree. There are three levels of rooms, 22 in total, all unique, all named. Maree smells fresh but not floral or sweet. I breathe in deeply. She is tidy and luxuriously minimalist. There are trendy touches that feel almost obligatory, like a Herschel Supply fanny pack in the wardrobe. But when I unzip it and realize it comes stocked with beach cleanup gear, I’m sorry for calling it trendy. Nate shows me how to use the record player and the shower, like I’m staying the night at a friend’s house. I appreciate the record player guidance, since in some other hotels I’ve been to there are foreboding “YOU BREAK IT YOU BUY IT” labels everywhere with no instructions in sight. I put on The Doors and dance. I collapse on the bed and consider never getting back up. I open and close the curtains. I make a mental note to utilize the balcony. I stand under hot water for ages. I appreciate the shower guidance as well. My husband joins me for dinner. It’s very low-key. We walk down a half flight of stairs. The staff are exceedingly present and gracious as ever. We choose a table nearish to a heat lamp. We order. Broccolini with tahini; octopus carpaccio with heat from harissa; lamb chops with sage-laced sweet potatoes and preserved lemon. The Middle Eastern ingredients invoke my favorite style of cuisine, but the plates never stray far from fresh, California-forward cooking, thanks to thoughtful direction from Chef Leo Bongarra. A tiered plate studded with oysters is lifted past us. It’s shareable, Mediterranean-inspired food we can’t find fault with. I take a bath, then I stand on the balcony overlooking the courtyard in my robe and listen to the dampened crash of the ocean. For the most part, the hotel has powered down for the night. It’s a Wednesday in North Laguna, after all. My eyes open to light softly fading in through the double-layer curtains. You could probably black the windows out completely, but I’m a morning person. The sky is pink with spun-sugar clouds over the ocean. A card had been sandwiched into my door the previous evening, advising me of the precise timing of the sunrise: 6:49. It also invited me on an adventure — a hike or a yoga class — starting at 9. For now, the sunrise is adventure enough. My coffee order arrives, served in the beautiful Japanese Hasami porcelain I have by now vowed to begin collecting for myself. Breakfast at Saline is on the house and cooked to order. More gorgeous tableware, more microgreens piled high on a plate. This time they accompany an egg, delicately folded cured salmon and roe, a schmear of Camembert and pumpernickel toast. The oj is fresh and pulpy. Yoga is beginning. I am invited to join at any time (I’m still cramming my face with egg, though, so no). It takes place on the rooftop deck next to Maree where Chef Leo’s herbs grow. Instead, I don my beach cleanup fanny and motivate to Shaw’s Cove, the inlet directly across Cliff Drive. The tide is low enough to allow a moseying walk over the craggy rocks. Colorful succulents grow as tall as trees on cliffs where a few lucky people reside. I return. I rinse off. I wrap up in my robe and head to the pool. Steam rises off the surface of the water, which, in turn reflects playfully on the underside of the beach umbrellas. Curving concrete steps and cushioned chaise lounges with cylindrical pillows in blue and canvas transport me anew to a coastal European retreat. The email warning me about Instagram overuse had led me to expect a poolside crowded with influencers. This is private, serene, the sun crowning over the neighboring buildings. By the time I am dressed, packed, and ready to depart, I really do feel rejuvenated. 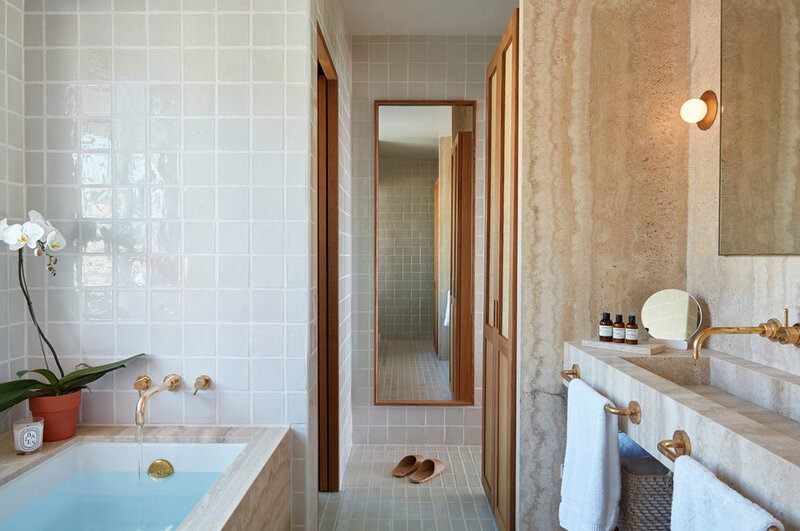 Perhaps it’s the exorbitant percentage of time I spent in Maree’s sleek white bathtub, or simply that this assignment has encouraged me to seek out the details, to narrate my experience to myself as it has happened. But I suspect there is something deeper at play, which is the hand-printed craft of true hospitality. It’s one thing to think of everything, to anticipate guests’ needs and wants — check, check! — and it’s another to really care about their well-being. At Hotel Joaquin, I observed and felt thoughtful reasoning behind every design. There’s no way to put it on a page without coming across as overly saccharine, but I left feeling like I’d been taken care of, and we humans, we need that. Lara Wilson Townsend is a writer and creative person based in Southern California. She likes to swim and steal soaps from hotels. When she's not traveling with her husband and dog, she can be found at Compound, their gallery and event space in Yucca Valley.